In the run up to the publication of King of Scars by Leigh Bardugo, the publishers BKMRK hosted a readalong of the full Grisha trilogy, one book a month from November to January. Now my copies are currently packed away, and I knew I wouldn't be able to dig them out and read them in time, so I decided to splash my Audible credits and hit up the audiobooks. The audiobooks are narrated by Lauren Fortgang and she does the most amazing job. To me, the story felt slightly different when she was reading compared to when I first read it myself. I loved the way she brought iconic lines and scenes to life. I listened to the books pretty much one after the other. I'd already read all three of them years ago when Leigh Bardugo and Sarah J Maas visited Seven Stories for the Summoners and Assassins talk, but coming back to the story - knowing how it was going to end - meant that I picked up on lots of little things I'd missed at first. And if anything, my anticipation was even higher. 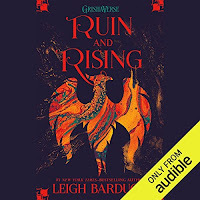 I'd definitely recommend these audiobooks as an introduction to the Grishaverse. They come first chronologically in the larger world, and they lay down the magic rules of the world. If anything, I thought the series was even better the second time around, and it's only really once the final book ends that the full impact of everything that's happened hits. 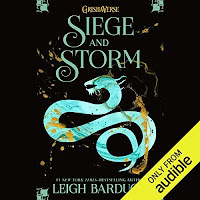 I think my favourite was Seige & Storm, then Ruin & Rising, and then Shadow & Bone, because as much as I enjoyed the first book, the second was my favourite. I'm not entirely sure why. Oh, hello Nikolai. I'm going to listen to the Six of Crows and Crooked Kingdom audiobooks next. And gosh, I'm excited for King of Scars tomorrow! The Darkling slumped back in his chair.“Fine,” he said with a weary shrug. “Make me your villain." Do you listen to audiobooks? What's your favourite audiobook? I'll keep it in mind to listen to the audiobooks whenever I want to re-read the trilogy! I'm really excited for King of Scars as well! I really want to read these! What fun!! My all time favorite audiobooks are the Harry Potter audios. They're just so much fun! I've been re-reading the Discworld books on audio and it's true the story is a little different when someone is reading to you rather than reading yourself! 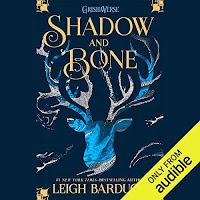 I've been meaning to read the Grisha books too but never get round to it, maybe I should get the audiobooks too.